Kirtan Scotland has been broadening the horizon of Kirtan yoga (Mantras with Music) in Scotland since 2009. 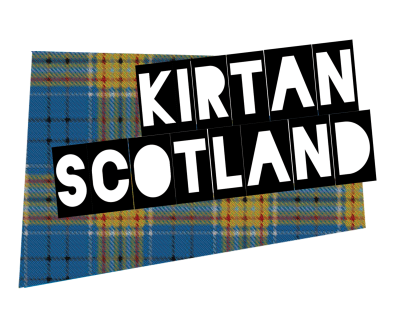 The Kirtan Scotland band uses an eclectic blend of both traditional and modern instruments and engage eastern and western melodies to form a wide variety from meditative to energetic. Chanting has been practiced for thousands of years by diverse cultures and is now undergoing a renaissance in the west. More than just music group chanting is a contemplative practice. It promotes community, peace and conscious living. Kirtan is one of the fastest growing forms of meditation in the world and for the 1st time it was performed at the Grammy awards in 2013. The Kirtan band "Bhakti without Borders" has been nominated for a Grammy in 2016. It is fun, it feels good, and brings one into a place of peace, well-being and blissful joy. In 2013 we went on the North of Scotland tour tour taking Kirtan to Glenrothes, Perth, St Andrews, Dundee, Aberdeen, Inverness, Strathpeffer, Findhorn, Elgin, Fort William & Oban. Regular Kirtan programmes are held in Edinburgh & Glasgow. Twice a year we also hold a major Kirtan event in Edinburgh (5 years running) in collaboration with Neill Walker of Edinburgh International Centre for Spirituality and Peace (http://www.eicsp.org). There are occasional kirtans held in Findhorn, Aberdeen, Dundee and Strathpeffer. These events range from 2-12 hours. For the past 2 years they have also performed at the Eden Festival @ the Vishnu Lounge as a head-liner and at the workshop tent. Check out https://www.youtube.com/watch?v=7lUEVVg2-zw. More about Kirtan: KIRTAN (pronounced keertan) is an ancient participatory enchanting mantra music experience. One of the oldest sacred music traditions of the world, the kirtan call-and-response chanting genre comes to us from India. Using ancient Sanskrit mantras to the accompaniment of instruments, the kirtan calls upon sacred energies which serve to quiet the mind, remove inauspicious things from the heart, bring us back to the centre of our own identity and awaken divine peace and love within us. It is the yoga of sound. All can participate in this chanting, the more participants, the greater the efficacy. Whether one is musically gifted or hasn’t got a rhythmical inclination, not considering caste, creed, colour, religious background or gender; all unite through the medium of this musical experience, transcending the mundane platform and transporting them to a spiritual realm far beyond the grasp of any modern transportation mechanism.